Such a delightful rug. This beautiful textile is known as a Yei or Yei Bi Chei style of Navajo Rug. The intriguing Yei style rugs are strongly representative of Navajo ceremonies centered on physical, mental, emotional and spiritual healing. The “Holy People” portrayed in Yei weavings communicate between the Navajo People and their gods, and are believed to restore health & spiritual well being when called upon in a properly conducted ceremony. In the beginning, the “Yei Bi Chei” style of Navajo rugs was controversial. In the 1920’s, Shiprock Trading Post owner Will Evans commercially developed this style to much uproar by the Navajo people. The Yei(Navajo Holy Diety) ,the Yei Bi Chei, and Navajo sandpainting ceremonies are religious deities, beliefs, and rites that the Navajo people hold sacred. 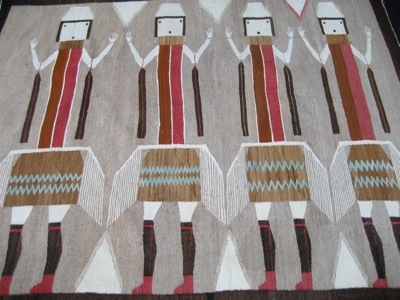 For these images to be duplicated on rugs during that time was thought to be taboo by the Navajo. Soon commercialism began to subdue the controversy. Never had the rug been passed on as being “sacred” by a Navajo. Although the rugs may depict Navajo religion, mythology and tradition, these rugs are in no way any type of “prayer rugs” or “ceremony rugs”. Despite the troubles it brought, the Yei Bi Chei Style of rugs have become a important part of Navajo history and developed into a beautiful style that is collected known world-wide.